In 1962, the Soviet space program had already achieved several firsts of what would become the Space Race between the United States and Soviet Union. They had already launched the first artificial satellite, Sputnik 1 into low Earth orbit in October 1957. Yuri Gagarin became the first man in space in April 1961. The Soviets wanted to be the first to launch a woman into space. A successful female candidate would have to be under 30 years of age, under 170 cm (5′ 7″) in height, 70 kg in weight and either a parachutist or pilot. From hundreds of applications, five women were selected to be female cosmonauts: Tatyanna Kuznetsova, Irina Solovyova, Valentina Ponomaryova, Zhanna Yorkina and Valentina Tereshkova. Each of these women underwent training that involved isolation tests, weightless flights, parachute jumps, centrifuge rides and pilot training. When the training and tests were over, Valentina Tereshkova was selected. On the morning of June 16, 1963, Vostok 6 launched flawlessly from the Baikonur Cosmodrome. 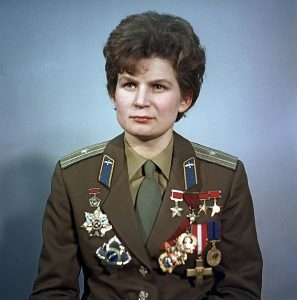 Valentina Tereshkova was aboard and became the first woman in space. She spent the next 70.8 hours orbiting the Earth 48 times. Her mission was typical for cosmonaut missions. She kept a log, took photographs and played human guinea pig while biometric data was collected to determine the effects of spaceflight on the female body. This data was compared to that of a male cosmonaut, Valery F. Bykovsky. Bykovsky was launched two days earlier aboard the Vostok 5 spacecraft. They must have gotten all the data they needed because it would be another 19 years before Svetlana Savitskaya became the second woman in space.